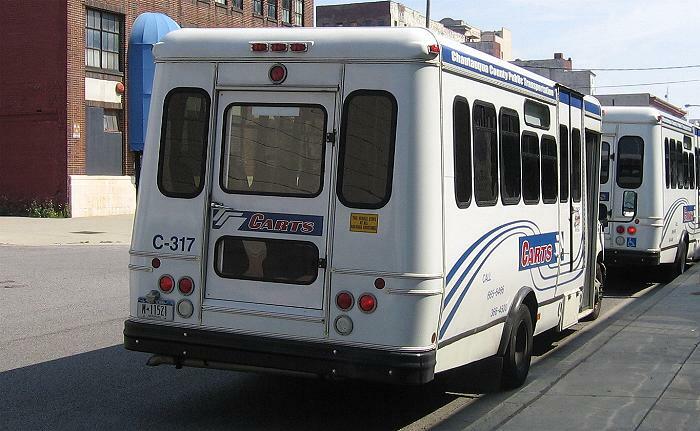 JAMESTOWN – Chautauqua County’s public transportation buses are searching for a new terminal location in downtown Jamestown. On Thursday, March 15, representatives with the Chautauqua Area Regional Transit System (CARTS) met with the city’s Strategic Planning and Partnership Commission to share details of public transportation in the area. During the conversation, CARTS officials informed the commission members that they are looking for a new central terminal area for the buses in the city. That’s because Gebbie Foundation executive director Greg Edwards informed CARTS recently that the buses will soon no longer be able to stand and wait along W. Second Street in front of the Gateway Train Station and the soon-to-be-opened National Comedy Center. That portion of the street will be temporarily be closed this spring to make way for the public piazza project. In addition, construction at the NCC is interfering with the waiting area that is used by riders. Edwards, who also served as Chautauqua County Executive for eight years prior to joining the Gebbie Foundation, tells WRFA he brought the issue forward to CARTS because of his familiarity with the bus system due to his work as county executive, as well as because of his involvement with downtown Jamestown development through Gebbie. Jamestown City Council president Marie Carrubba, who serves on the Strategic Planning and Partnership Commission, said Thursday was the first she had heard that there was a need for finding a new location for the buses, adding that the city and public safety committee will have to review and okay the relocation. “It needs to go to the Public Safety Committee since this is an issue on the streets involving how vehicles will get around the buses, as well as the passengers who attempt to ride CARTS and will be getting on and off the buses. We need to really look at this and see how we’ll get people safely through that area and if there is a relocation, probably as close in proximity to the area that people are used to going to to get on the buses,” Carrubba said. Another concern that came up during the discussion is the requirement that a portion of the train station remain open for public use because part of its restoration was funded by federal transportation money, meaning that any future use of the facility needed to be tied in some way to public transportation. Since the train station currently does not have passenger service trains, Carrubba noted that the only other public transportation use for it at this time is as a central terminal for the CARTS system. “The issue of receiving the federal funds for that transportation hub, we need to keep that open as a transportation hub. I know there have been a few discussions, I think because there are some concerns with the amount of people that will be traveling through that area, especially when we have visitors from out of town [for the National Comedy Center. We’ll be looking at that too, but I think it needs to first go before public safety for any suggestions and discussion,” Carrubba said. According to Carrubba, the city’s public safety committee will discuss the matter in the coming weeks, while city officials will also be in contact with CARTS officials to help address the relocation issue. CARTS has used the area in front of the Gateway Train Station since February 2013. Before that the waiting area was at Baker Park between W. Fourth and Fifth Streets in the city.